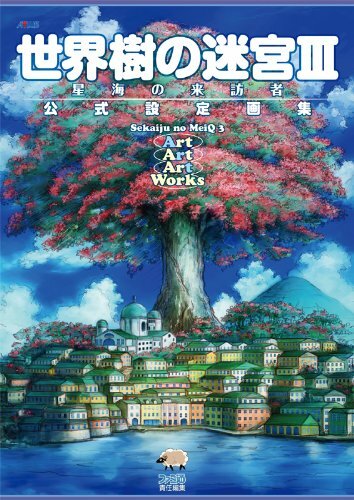 You might have remembered that I also reviewed the first art book, 世界樹の迷宮 公式設定資料集 (Sekaiju no MeiQ). It seems that they skipped the art book for Etrian Odyssey II (the other name for Sekaiju no Meikyuu). This is a 192-page paperback art book, 80 more pages that the earlier one. So it's filled with more chibi goodness which comes in the form of designs for the characters (including NPC), creatures and enemies. The colouring is anime-style and the illustrations are really cute. There are lots of costume changes to check out. I really like the costume designs. They are refreshing and elaborately drawn. The background art is also very beautiful, idyllic and has a good fantasy feel to it. Most of the pieces are accompanied by sketches as well. It's a nice art book if you like video game art or chibi characters. There's more content at the same price as the previous art book. i wonder what game platform it is?? Thank you for reviewing this book, I really like the look of it and would like to purchase it in the future :) I still haven't played the games yet though! FYI, this is what's generally categorized as a fanbook or visual book, not an artbook, which means it's focused on production, rather than specifically on the art, and has lots of sketches, production notes, interviews, and so on. Artbooks, focusing in on the art itself, tend not to squish 8-10 images on a page (rarely having more than one) and don't have much text. Most of these have ファンブック or ビジュアル in the title, so people know what they're getting, but this one doesn't. hey, i was wondering. Did you buy using amazon.jp? I dont' live in japan, so how would that work? how did you get urs? Check out the Amazon Japan Shipping Guide I've wrote. It's safe. If the item gets damaged, they will send a new one.